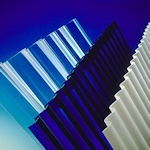 These products offer excellent clarity, weathering performance, and high impact strength. LEXAN™ Corrugated sheet is available with Dripgard coating which is a special drip control coating that prevents loss of light transmission caused by condensation. Dripgard also prevents water droplet formation which can cause plant diseases and spoilage.